See such legends as Flex Wheeler, Paul Dillett, Vince Taylor, Lee Labrada, John Terilli, Samir Bannout, the late Ray McNeil and many more. 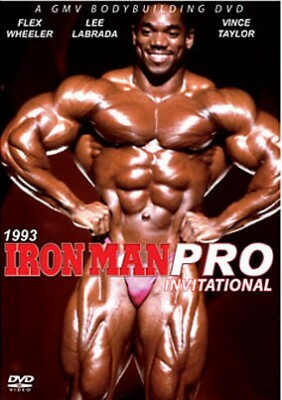 The 4th sensational Iron Man Pro Invitational DVD showcases the best, most incredible physiques of the early nineties. See such legends as Flex Wheeler, Paul Dillett, Vince Taylor, Lee Labrada, John Terilli, Samir Bannout, the late Ray McNeil and many more. See 1993’s early season line-up of the best pro bodybuilders in the world. After a titanic battle, a ripped Flex Wheeler emerged victorious. The DVD includes highlights of the prejudging as well as the evening finals. The event was shot at Aviation Park Auditorium, Redondo Beach, California and was produced for Iron Man by American Sports Network, Inc.
Cover photo by Mike Neveux, Iron Man magazine.